Last month Instagram introduced the new video feature for the Instagram users, but there is no simple way to embed those instagram photos and video on website or blogs. To do this you have copy the image link and then post it into the website or blog. But now today Instagram announced that the users can embed Photos and Videos on any website or forum. The new feature is available from today for all Instagram users. Now you can easily embed you favorite Instagram video or photos on your website or blog and share with your readers and visitors. One of the best feature which most of the Instagram users are looking for a long time. This one is the inbuilt feature of the Instagram, so no need to install any addon or extension on your browser to embed your instagram video and photos. So lets take a look how you can Embed Instagram Photos and Videos on Websites like WordPress, tumblr, Blogger, and others. 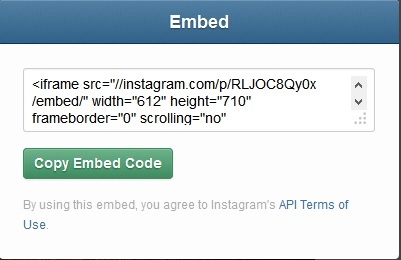 Click on the share button and now you can see the embed code of the video or image. From here you can simply copy and paste it into a blog post, a personal Web site or any other HTML website to post that pic or video. On the same embed image you can see two option Useranme and View on Instagram button, it takes you directly to the Instagram page for the photo. From here you can like the image or video and add a comment on it. Possess all been rendered in spectacular 3D that properly models the real activities.